Some 1,000 illegal settlers, escorted by Israeli soldiers, have stormed Joseph's Tomb on the outskirts of Nablus, during the early hours of 7 April, the AhlulBayt News Agency (ABNA) reports. The Israeli authorities have restarted construction work on the separation wall in the Cremisan beginning April 2016. Once the home of centuries-old olive trees, an eight-feet wall now snakes through the village cutting off farmers from lands, children from schools, and people from people. The conference “Christ at the Checkpoint” will gather an international group of evangelical Christians from around the world in Bethlehem from 7-10 March 2016. Organized by the Bethlehem Bible College, the 2016 edition, which is also the fourth since its inception, has adopted the theme "The Gospel in the Face of Religious Extremism”. 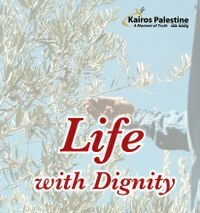 ​"Life with Dignity" was the theme of an international conference held Bethlehem in 2014. Jointly organized by Kairos Palestine, Palestine Israel Ecumenical Forum and the Alternative Tourism Group, the conference report includes Biblical reflections, analysis, opinions and testimonies. Religious right-wing extremists are suspected to have once again launched an attack on Jerusalem's Dormition Abbey, the Haaretz journalist Nir Hasson reported on 17 January. Fr Paul Lansu, Pax Christi International policy advisor and a member of the PIEF core group, attended the Holy Land Coordination 2016 - an event that brought together Roman Catholic bishops from across Europe, North America and South Africa. A final statement, “You are not forgotten,” has been published. Twelve Roman Catholic bishops from Europe, South Africa and North America visited the Cremisan Valley on 10 January as part of the Holy Land Coordination, in which they come to show solidarity with Palestinian Christians. A Cremisan Valley landowner told them how the situation was not "simply politics" but about "people's lives and about their dignity." The Pension and Health Benefits Fund of the United Methodist Church, worth 20 billion U.S. dollars, has declared the five largest Israeli banks "off limits for investment". It has divested funds from two of these banks, which had previously been part of its portfolios. The Christian cemetery of the Salesian monastery not far from West Jerusalem has been desecrated by unknown perpetrators. The Latin patriarchate in Jerusalem has reported that numerous crosses were toppled or destroyed. The monastery authorities pointed to previous incidents of vandalism, including blasphemous graffiti written in Hebrew. 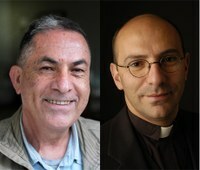 The 2015 Olof Palme Prize is awarded to the Palestinian pastor Rev. Dr Mitri Raheb, and the Israeli journalist Gideon Levy. The Holy See declared on 2 January that the Comprehensive Agreement between the Holy See and the State of Palestine has entered into force. It had been signed between the two parties in June 2015. The agreement concerns “essential aspects of the life and activity of the Church in Palestine”. It also reiterates support for a “negotiated and peaceful solution” to the Arab-Israeli conflict. Even though the Christmas tree on Bethlehem’s Manger Square has officially been lit, festivities in Bethlehem, the place where Jesus was born, will be muted. The ongoing unrest across the Holy Land makes celebrations difficult. On 7 October 2015, a group of local Christians convened by the co-moderators of the Palestine Israel Ecumenical Forum met to assess the current situation and discern how Christians should act in the local context and on the international level regarding the conflictive situation in Palestine and Israel. In a video message, Yusuf Daher of Kairos Palestine speaks about recent incidents that called into question the status of the Al Aqsa Mosque, and the need to respect the status quo both on the Temple Mount and in Jerusalem. NCCOP has announced it would launch the World Week for Peace in Palestine Israel 2015 with a special service on 19 September led by Bishop William Shomali, an auxiliary bishop of the Latin Patriarch of Jerusalem. In a petition addressed to representatives of foreign governments to Israel and Palestine on social media, PIEF and the National Coalition of Christian Organizations in Palestine are asking for international intervention in the shocking situation in the Cremisan valley and Bir Ouna in the West Bank. United Methodist Kairos Response (UMKR) has reacted with condemnation to land being confiscated from 58 Christian families in the Cremisan Valley. UMKR also condemns the stop-work order for a soccer field in the Muslim village of Wadi Foquin. Several thousand Christian protesters have demonstrated in Jerusalem on Sunday 6 September against funding cuts and what they describe as unequal treatment by Israel's education ministry, according to media reports.